Well times have changed and besides “paint” maybe nothing more so, in a hardware store, than “light bulbs.” With changes in energy legislation, the extinction of regular incandescent light bulbs, the short lived CFL’s and the advancement in quality, and the affordability of LED bulbs, buying a light bulb can be confusing – and sometimes it seems like you need a PhD. But not to worry, Woodstock Hardware has kept up with all of the changes in the light bulb industry, and through the school of hard knocks earned their PhD in light bulbs and have both products and expertise to help you select the right bulb for your needs. Our selection of light bulbs is current and offer s a full selection of the most up to date lighting solutions. Woodstock Hardware stocks 100’s of different light bulbs to meet the needs of our customers who range from homeowners, to local businesses, to commercial and industrial business owners. All of which have unique light bulb needs. We do carry a full range of LED lighting to meet just about every need from interior, exterior, decorative, colored, and even LED bug light bulbs. We pride ourselves in the fact that we take the time to update and teach our customers about these LED bulbs and how to understand and compare all of the new product labeling in order to find the bulb that best meets their needs. And we are happy to take the bulb out at the store and screw it into our light bulb display to make sure the light from the new bulb looks just like what our customers want and need. While they are still available we continue to stock a wide range of “conventional” lightbulbs including standard halogen bulbs, compact fluorescent, a few specialty incandescent light bulbs, decorative light bulbs, globe bulbs, outdoor floodlights, and heat lamps. What does all of this mean? Well, it means that when you come into Woodstock Hardware and end up dazed and confused in front of the wall of light bulbs Woodstock Hardware will take the time to explain as much as you want to hear, find the best bulb to meet your needs, and then show you what that bulb looks like on to make sure you like it before you leave the store. 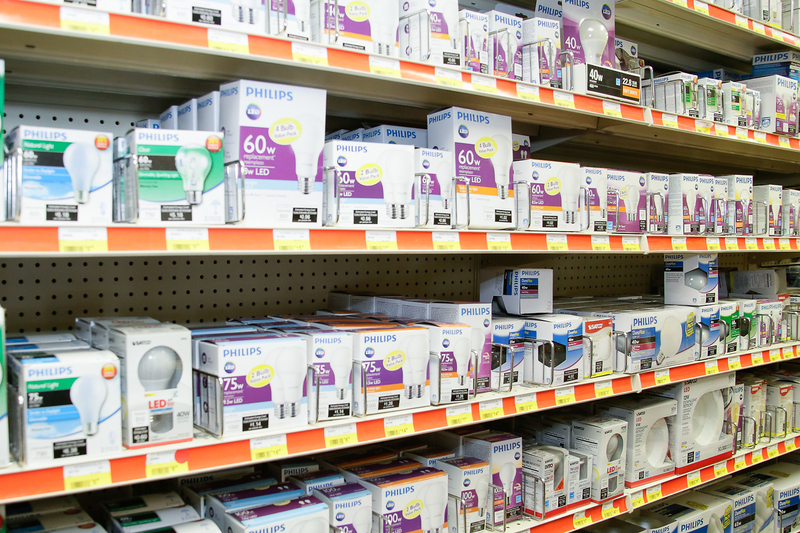 After you check out and leave the store you may actually feel like you just earned a PhD in light bulb technology! But what happens when you get home and try the bulb and decide you need something different? No problem. We guarantee your light bulb shopping experience and let every customer know that if you get home and don’t like the bulb you selected, simply return the bulb to the store and we will work with you to make sure you get one you are 100% satisfied with. 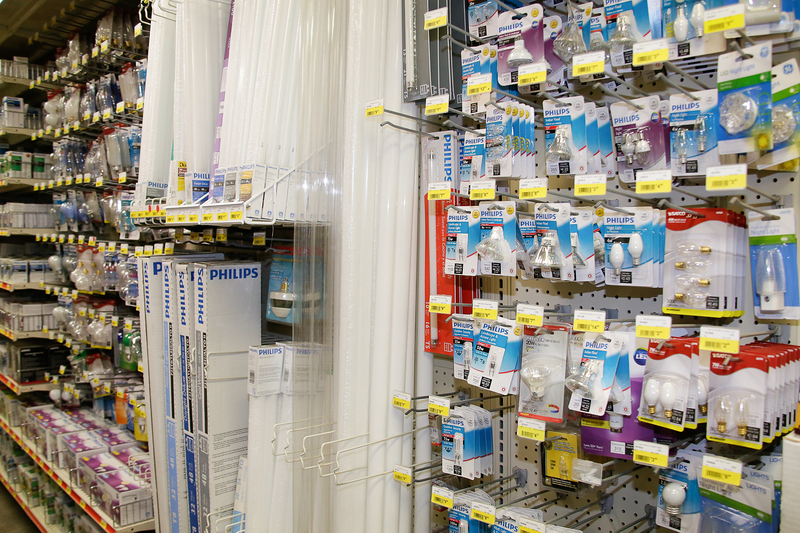 In addition to the Light Bulbs you need, with over twenty-five years of experience, Woodstock Hardware can provide you the technical expertise required to help you get what you need. Here are the cliff notes for one of our “light bulb courses” offered in the store. Light bulbs are no longer compared by watts. Those were the old days. Watts is a unit of power not brightness. So, who cares about watts. You will only care about watts when you see that a “normal” halogen 60-watt light bulb uses about 53 watts and an equivalent 60-watt LED bulb uses only about 7 watts. That means a much lower electric bill for you! Light bulbs are compared by lumens. A lumen is a measure of brightness and this is what you want to watch for when you buy light bulbs. For those who are curious a lumen is the amount of light given off by one birthday candle that is one foot away form you. Just to give you an idea, an old 60-watt bulb gave off about 750 lumens. A new 60-watt LED bulb gives off 800 lumens. So depending on the manufacturer a little more light. But you are getting that much light and only using 7 watts instead of 53 watts! A win win for you. After seeing what might need to be done to make sure our customers are satisfied with their light bulbs I think you can agree there is some truth to our statement about “needing a PhD to buy a light bulb!” There is just a lot of new facts and figures out there to take in. But thankfully we do have “our PhD” and we are here to help. So regardless of what kind of light bulb you need, or if you are ready to convert your home or business to LED lighting Woodstock Hardware has the products and supplies you need.